The best way to make your podcast. Create and host unlimited episodes, distribute your show everywhere, and make money. All in one place, all for free. We don’t believe in charging creators to make or store their content. No storage limits, no trial period, no catch. Make your podcast available everywhere people listen (including Apple Podcasts, Google Podcasts, and Spotify), with just one click. Get paid for your plays by beloved brands we’ll match with your show, or collect monthly payments from your listeners. Or both! Record with guests or cohosts anywhere in the world, or collect voice messages from your listeners to include in your episodes. See at a glance how your podcast episodes are doing over time, so you can understand and grow your audience. Anchor’s mobile apps, iPad app, and desktop platform make it easy to capture audio anywhere, anytime. Ready to make your podcast? 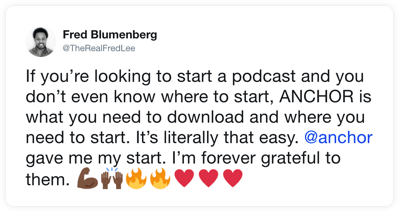 Already have a podcast? Switch to Anchor and never pay for hosting again.